Why do they use the singular "man" and not the plural "men"? No God or King. Only Man. but it doesn't. For the first two words the plural form is used, why not for "man"? Edit: Maybe this is not a question about the language but rather one about the meaning in the game's context. Man is being used as a singular collective term describing all of humanity. I believe that the point is that "Gods" and "Kings" would be separate entities (or special distinctions) that would be distinguished within mankind or distinct from mankind. The point of the phrase is to say there is only one group, "Man", and no important other distinctions or hierarchies. The quote is based on the principle of Objectivism (proposed by Ayn Rand) which focusses on the importance of freedom from all kinds of authority for true happiness. Man is pitted against gods, kings and his fellow men. 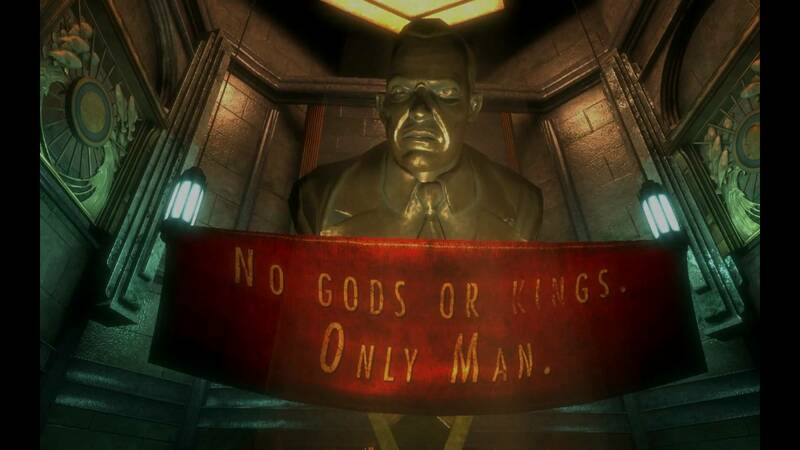 It is true that the narrative elements of the game are heavily influenced by Objectivism as @peerless suggests. Arguably, the narrative is a critique of Objectivism, or at least, "It's about what happens when ideals meet reality." it was hard for people to understand exactly what I meant by "utopia." I didn't mean a place where everyone holds hands. [...] They started building a hospital, and I said, "No no no, it has to be thirty competing businesses, really crass advertisement." [...] There's no central administration. Everything's about competing businesses. The game is full of "crass advertising" that is often totally unveiled propaganda for the point of view of the particular faction. Though "man" is often used for "mankind," the singular "man" in this particular case is intentional and reflects a sort of militant Individualism that the underwater utopia was built upon (the Ryan faction). Not the answer you're looking for? Browse other questions tagged word-choice quotes or ask your own question. Can “shrugging” only be done with shoulders? What would be the opposite of “Divine Saint King”? How to say “nonconfluence” in context of God and man? What's the origin of “wife-beater” when used as a sleeveless shirt and why is it not frowned upon?